Santa shouldn’t get all of the treats! 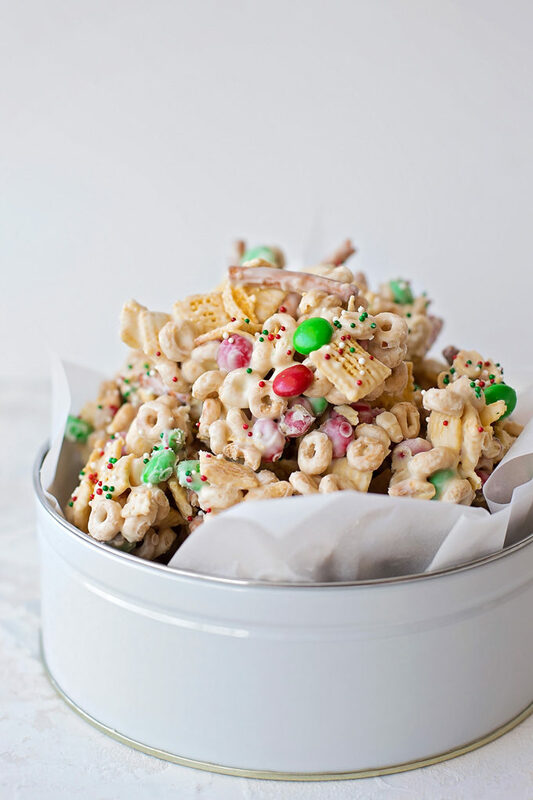 This fun and festive reindeer chow is a sweet and salty mix of cereal, pretzels, peanuts and M&Ms. We’ve been laying low for the past few weeks thanks to a never-ending cold that we all have. It’s been going strong since Thanksgiving and we just can’t seem to shake it. It started with our oldest and it has slowly made its way back to him. SOS!! I’ve been trying to come up with some indoor activities to keep the kids entertained. So far we’ve bedazzled foam christmas trees, wrapped a pile of presents, stamped cards for everyone we know, played dress up, made a train track from one end of the house to the other, and spent the mornings making no-bake treats like this white chocolate covered reindeer chow. 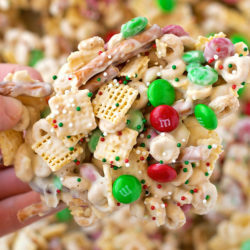 Growing up my mom would make what she called “reindeer fodder.” It was really similar to this version, only it used almond bark and the mix-ins weren’t exactly the same. 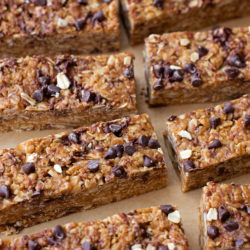 It was a delicious no-bake treat nonetheless. This easy, kid-friendly recipe is perfect for little helping hands. They can do just about everything with the exception of heating the chocolate. It takes all of 18 minutes to make, and that’s being pretty generous. 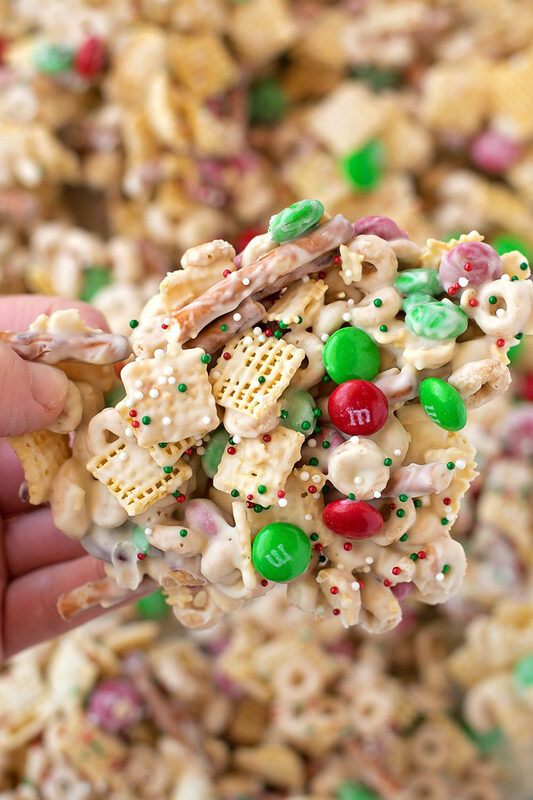 All you have to do is combine the cereal, M&Ms, pretzels and peanuts in a large mixing bowl pour the melted chocolate over top and mix until everything is coated. 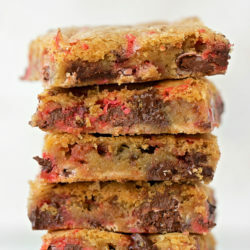 Pour it onto a lined baking sheet, add a few pinches of festive sprinkles and pop it into the fridge to set. The saltiness of the pretzels and peanuts helps balance out the sweetness of the white chocolate. P.S. 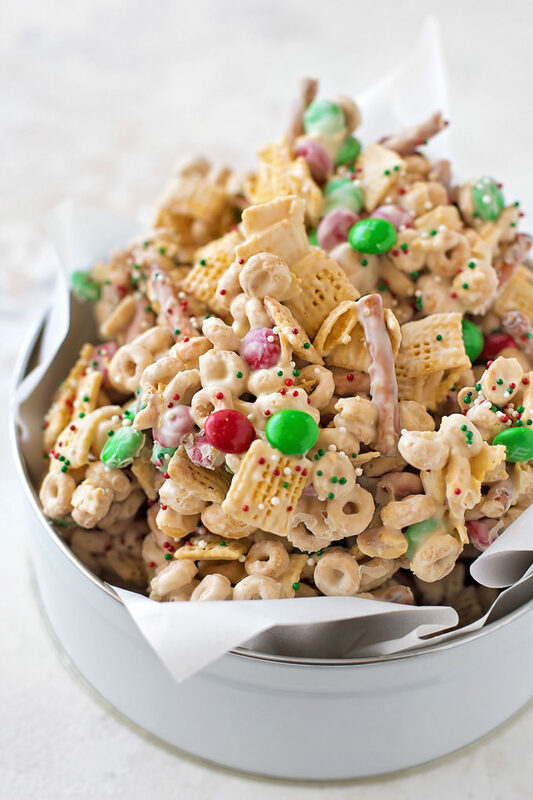 I’m not a huge fan of white chocolate, but in this snack mix it’s subtle and buttery tasting. My kids were SO excited to get to try this reindeer chow. It’s full of all of their favorite things! 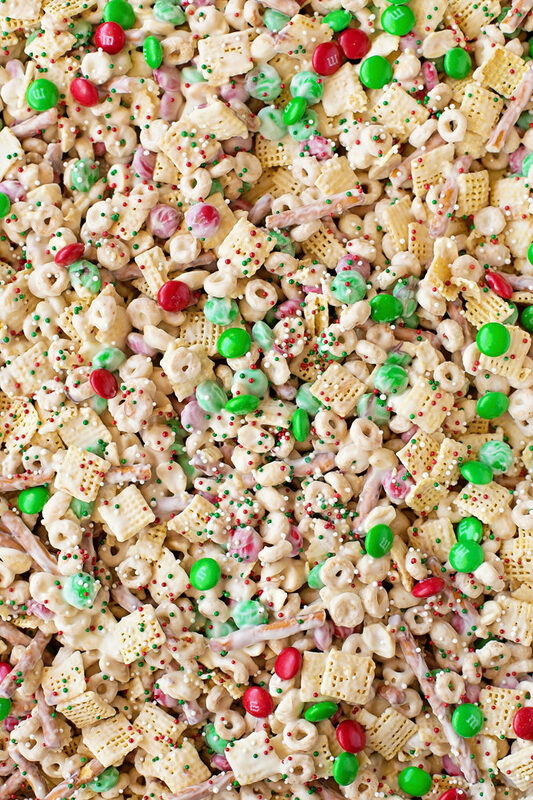 This is such a fun, festive recipe for Christmas, and so easy too! If you don’t have the exact ingredients you can always use what you have on hand. Sometimes we swap out the Cheerios for Kix and the peanuts for cashews. No matter what you use, it’s bound to be delicious! Line a rimmed baking sheet with wax paper, parchment or a silicone baking mat. Set aside. 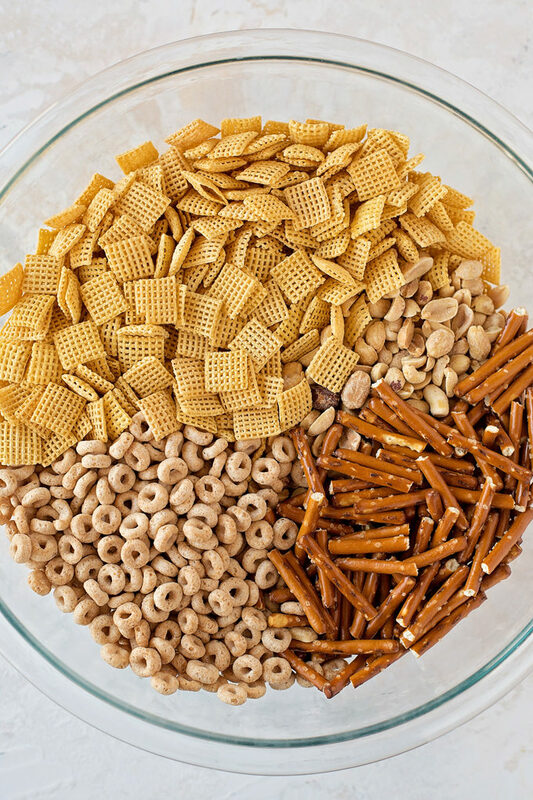 In a large mixing bowl combine the cereal, M&Ms, pretzels, and peanuts. Set aside. In a double boiler or in the microwave, melt white chocolate and shortening until smooth. Remove from heat and whisk in vanilla extract. 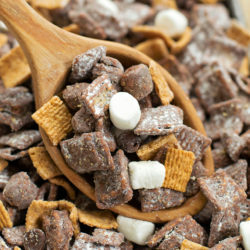 Pour chocolate over the cereal mixture and stir until evenly coated. Pour over the prepared baking sheet, add sprinkles over top. Place in the refrigerator and chill for 30 minutes before breaking apart into chunks.